I titled this one ‘Winter is coming’, but actually I was only partly kidding. As it happened, the Ísafjörður Tourist Office hadn’t been exaggerating when they told me that the 61 to Akureyri was a much easier drive than the 60 into Ísafjörður had been; while there were some unsurfaced stretches, and the wind was still up, by and large the road was much better, and a lot more sheltered, to the extent that I even braved a scenic long-cut to hug the North coast and didn’t regret it at all. Like the south road, the 61 follows the Westfjords coastline a lot of the way on its trip to meet up with the 1 road, and the combination of clouds and strong wind created a lot of brief rents in the weather letting patches of light pick out areas of the fjords and the mountainsides. After the past two days, there were patches of snow on the upper levels of several mountains along the route; none near the roads I was using. In fact, I passed through a series of inland valleys where not only was there no snow, but the weather took a break and it looked like mid-summer for the better part of two hours. For want of the actual name, I christened that stretch The Shire. I got into Akureyri in good time for tea (this time, Google had managed a semi-realistic trip estimate), and even managed to snag a parking space right outside the hotel (did I mention how much I love visiting Iceland off-season? Even with the risk of the occasional gale, the absence of huge crowds is awesome). Thursday was the day that the forecast predicted everything from snow to gales, so I opted to explore town. When the weather lifted for a bit, mid-morning, I took a photo (header image), of the mountains I’d driven around the previous day. The snow had made some serious progress overnight. Despite a very welcoming staff at my hotel, and an excellent hotel room, I didn’t find that Akureyri had quite the same happy flair that Ísafjörður had had. For some reason that may have been simply down to the weather, the whole town felt weirdly depressed. There were no insane kayakers, and no-one in the Tourist Office who could have done extras work in a Viking movie laughing about tourists and first-time experiences in one-way tunnels. Instead, there were a lot of big, empty roads full of puddles, and a lot of museums that had either been lifted into another dimension, or which were present in this dimension, but closed. I resorted to the Café Laut on the Hafnarstræti to warm up. Like most Icelandic eating places, it’s not exactly cheap, but the coffee was excellent, and so was the snack I treated myself to. It was also peaceful, which I totally appreciated (off-season. I tell you, it’s the only way to go). I imagine it looks even better under sunlight, but I thought it looked pretty awesome even in wintry weather. Lake Mývatn – door into autumn. 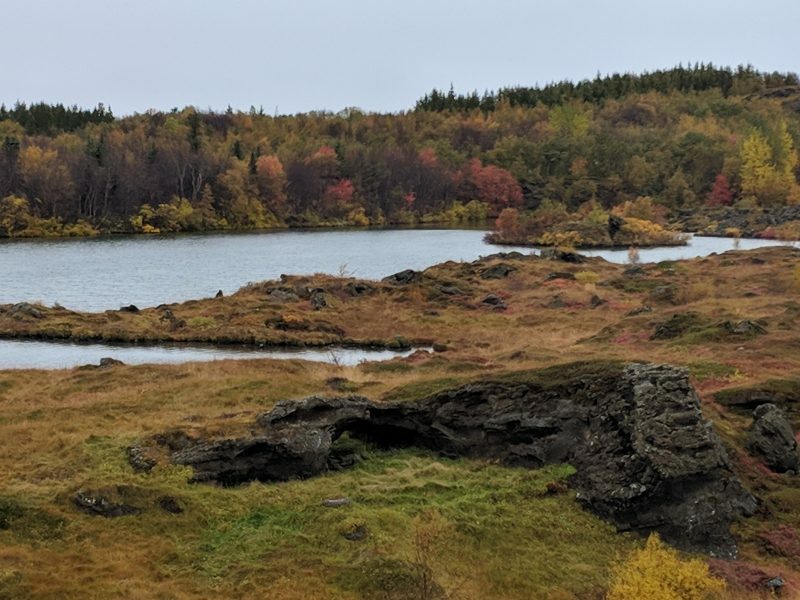 The second stop of the day was Lake Mývatn, and the nature baths there. The baths were a stop I’d half-intended to cut short, since it was snowing by the point I completed the circle road around Mývatn, but in the end I went in. I spent a happy hour basking in the geothermally-warmed pools of mineral water, watching the snow blowing across, and poking rather disbelievingly at the lava rocks along the edge of the pool, and come to the conclusion that it would have been no less than irresponsible of me to visit Iceland twice and miss out on the famous geothermal pools both times. Nice and warm and feeling smug, I decided to stretch my luck and try to push through to Dettifoss. It was the last stop on my planned tour for the day, and I was feeling my oats after an hour of being completely warm and lightly steamed. Despite the safetravels.is site noting that the roads East of Mývatn were under a winter conditions advisory, I headed out. 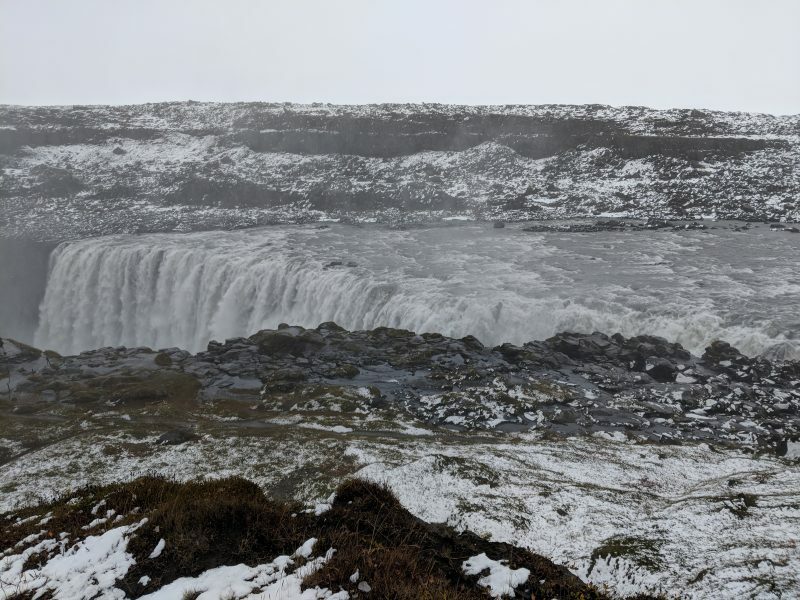 Dettifoss waterfall is the most powerful waterfall in Europe, and it also shows up in one of my favourite Desmond Bagley thrillers, Running Blind. In the event, the first part of the drive lulled me into complacency. It looks like nothing on Earth, and smells of men’s urinal. I pulled off at Hverir, because I have a weak spot for Iceland’s steaming hillsides, and especially when they’re stained every shade from yellow to ochre with sulphur and other deposits. Goodness gracious, great pools of mud. 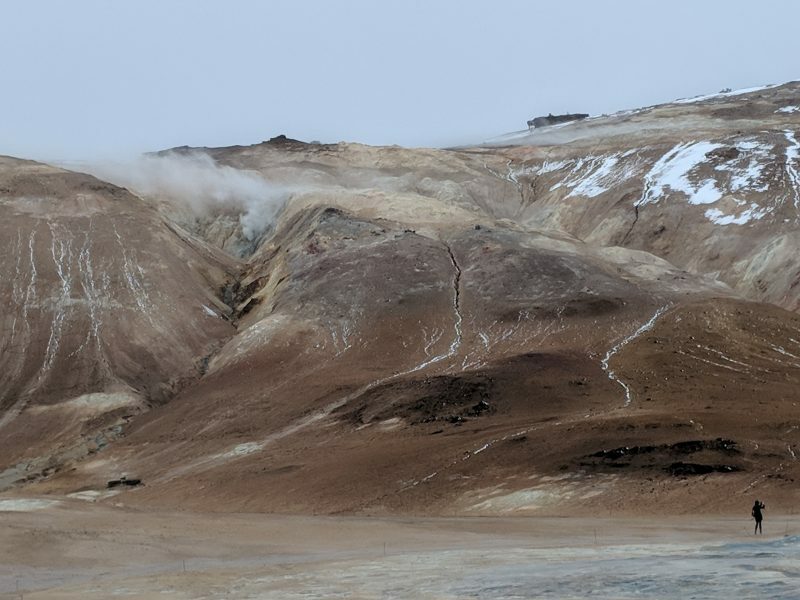 Like its smaller cousin in Reykjanes, Seltun, Hverir features geothermal activity, multi-coloured earth, and some impressive fumaroles. 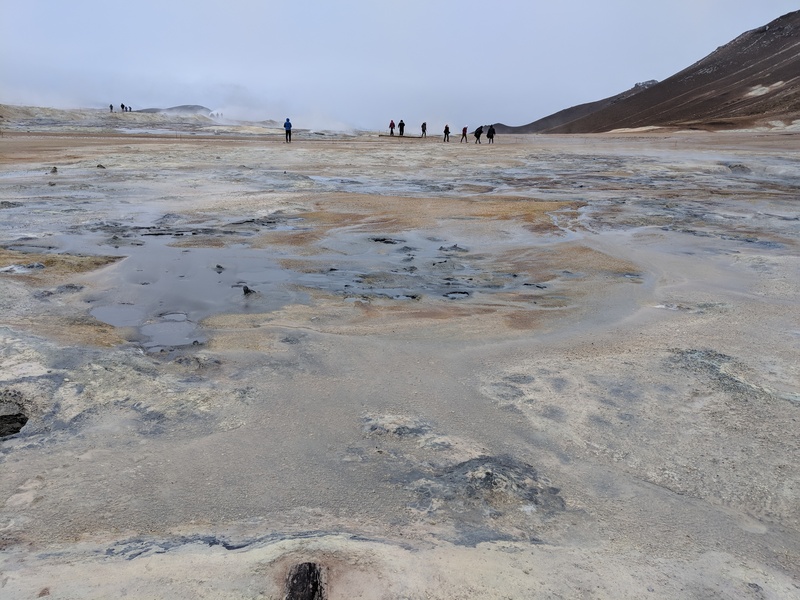 Unlike Seltun, it’s much larger, and while there’s a sizeable car park, it hasn’t yet been completely idiot-proofed, so you can get up relatively close and personal with the bubbling mud pools. After that, I pulled back onto the road, narrowly missing a large inbound coach, and headed on to Dettifoss. It was copacetic until I hit the 862 out to the actual waterfall; it said 10 km, but I swear to god I drove an hour long an increasingly-snowed in road to get there. Luckily I did have a 4x4, because I passed one hatchback who had somehow managed to come right off the road and was sitting out there in the snowfield looking less than amused. Luckily for them, the road patrol is well-aware of the likely preparedness of tourists, and sent along a snow-plough team. Dettifoss itself – with snow. 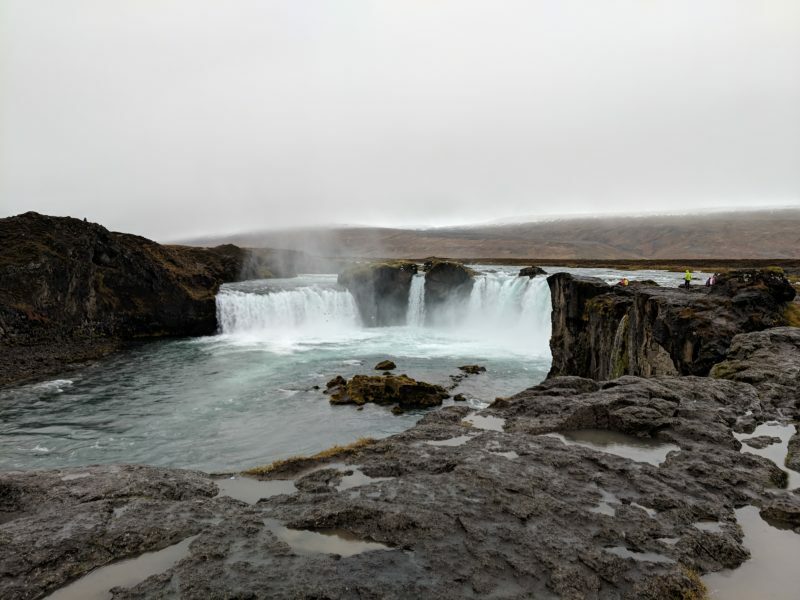 Dettifoss itself was awe-inspiring, but if I’m completely honest, it didn’t make my top 10 favourite Icelandic waterfalls, as Dynjandi immediately did. Part of that may have been the utterly grim weather that had the area firmly in its grip by the time I got there, but overall it didn’t inspire me to overload my photo memory trying to capture it. Despite the weather, it was also surprisingly busy, and since the path hadn’t anticipated snow and hundreds of tourists, it was basically an ankle-deep river. I’m glad I saw it, but I probably won’t bother making a return visit. Mývatn, now, I could be persuaded to revisit any time, especially off-season, as I got a substantial section of pool completely to myself to float in.